Greater Shepparton City Council, the Country Fire Authority, and Victoria Police assist to regulate fires in the open air. For any life threatening situation, call 000. Council's Local Law Number 1, clause 2.3, regulates the lighting of fires in residential or commercial areas. Permits to burn may be issued depending on a number of considerations including the location and the material to be burnt. During the CFA declared Fire Danger Period, the Country Fire Authority Act 1958 restricts the lighting of fires on any land. a fire lit by a member of the Country Fire Authority in the course of his or her duty or a member of the public who holds a permit under the provisions of the Country Fire Authority Act 1958. On any Council land it is an offence for a person without a permit to light and maintain any campfire or barbeque using solid fuel unless in a Council installed barbecue. Under the Environment Protection Act 1970, it is an offence to burn any commercial, industrial or household waste. This includes wooden pallets, treated timber, plastics, chemicals, rubber, plastic, oil, paint, and food waste. unless in accordance with a licence issued by the Environment Protection Authority (EPA) or a permit issued by Council. See our Waste and Recycling section for information about how to appropriately dispose of waste. Failure to comply with the Country Fire Authority Act 1958, the Environment Protection Act 1970 or Council's Local Law may result in legal action being commenced by Victoria Police, the Country Fire Authority (CFA), the Environment Protection Authority (EPA) or Council. A person who has lit or allowed a fire to be lit or remain alight, or has burned or caused or permitted to be burned, contrary to clause 2.3 or 2.4 must extinguish the fire or burning materials immediately on being directed to do so by an authorised officer. The Fire Danger Period is declared by the CFA and restricts the use of fire in the community, to help prevent dangerous fires from starting. The CFA declares the Fire Danger Period for each municipality at different times in the lead up to the fire season, depending on the amount of rain, grassland curing rate and other local conditions. The Fire Danger Period may be declared as early as October and remains in place until the fire danger lessens, which could be as late as May. The City of Greater Shepparton is located in the Northern Country CFA Fire District. Once the Fire Danger Period has been declared, fire restrictions come into force. This means you cannot light a fire unless you have a Schedule 13 or Schedule 14 permit, a Local Laws permit or comply with certain requirements. If you don't obtain a permit or comply with CFA requirements, you could be breaking the law and may be prosecuted. For more information, please visit the CFA website. 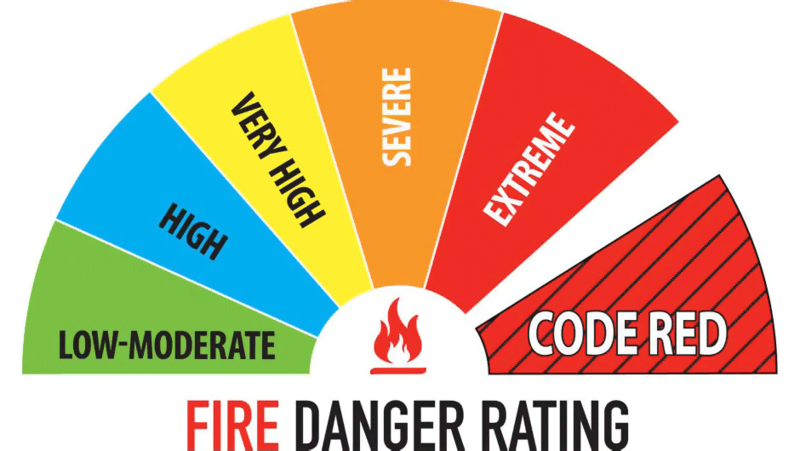 The CFA forecasts Fire Danger Ratings every day for different districts around Victoria to advise the community of how dangerous a fire would be if one started. Total Fire Ban days may be declared by the CFA on days when fires are likely to spread rapidly and could be difficult to control. On a Total Fire Ban Day, there are strict restrictions on what you can and can’t do. If a district has not been declared a Total Fire Ban, fire restrictions may still apply for each municipality. For more information, please visit the CFA website. During the Fire Danger Period, the lighting of fires is restricted under the Country Fire Authority Act 1958. If you wish to light a fire in the open air or conduct a burn, you must obtain a written Schedule 13 permit from Council's Municipal Fire Prevention Officer. Applications for Schedule 13 Permits for purposes other than essential agribusiness will not be issued. A Permit Application fee will apply for a Schedule 13 Permit to Burn By a Private Person issued in accordance with the Country Fire Authority Act 1958 and is required to be paid upon collection of approved permit(s). This fee is nonrefundable. The fee is payable once only per fire danger season. The permit application is valid for a limited time period and is subject to change without notice. After this time extensions will be granted if required. Applicants are to consider all of their permit needs for this period and nominate land planned to be burnt during the declared Fire Danger Period for the purposes of agribusiness. An application for a Schedule 13 Permit may only refer to land within the Greater Shepparton municipality and is not applicable within National Parks, on protected public land or within any fire protected area under the Forest Act 1958.